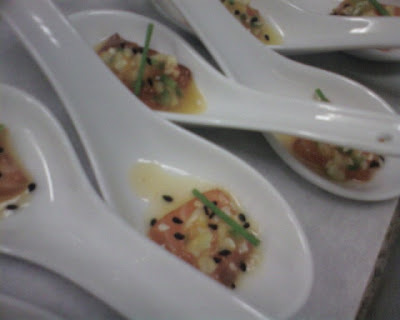 Today's Amuze: I took the salmon and diced them into 3 inch cubes... marinated in: sweet soy, sambal olek, sesame oil & sugar for 30 minutes at room temp. Made the salad from small diced fennel, jalepeno, orange zest, sweet chili sauce and rice wine vinegar. Took the salmon out of the syrup mixture and sliced thin. Coated the top with the fennel salad.